In a few weeks, my colleague Maribeth Gandy and I will be presenting a paper at UIST 2014 (ACM's User Interface Software and Technology conference), reflecting back on what we learned from our DART system (The Designer's Augmented Reality Toolkit, the first paper on DART was published at UIST 2004!). Along with our paper, we want to demo some of the old work we did with DART, but 10 years is an eternity in computer time! Fortunately, some of the old laptops and technology are still sitting on shelves, so today we fired a few of them up. Much to our surprise, one of the Toshiba laptops was actually hibernating, not shut down. DART was created as an extension to (then Macromedia, now Adobe) Director, the authoring environment for Shockwave content. And, low and behold, Director was sitting there running! Poking around, it appears we put this machine to sleep in 2007 or so; it's like waking a fairy tale creature (minus the kissing part). 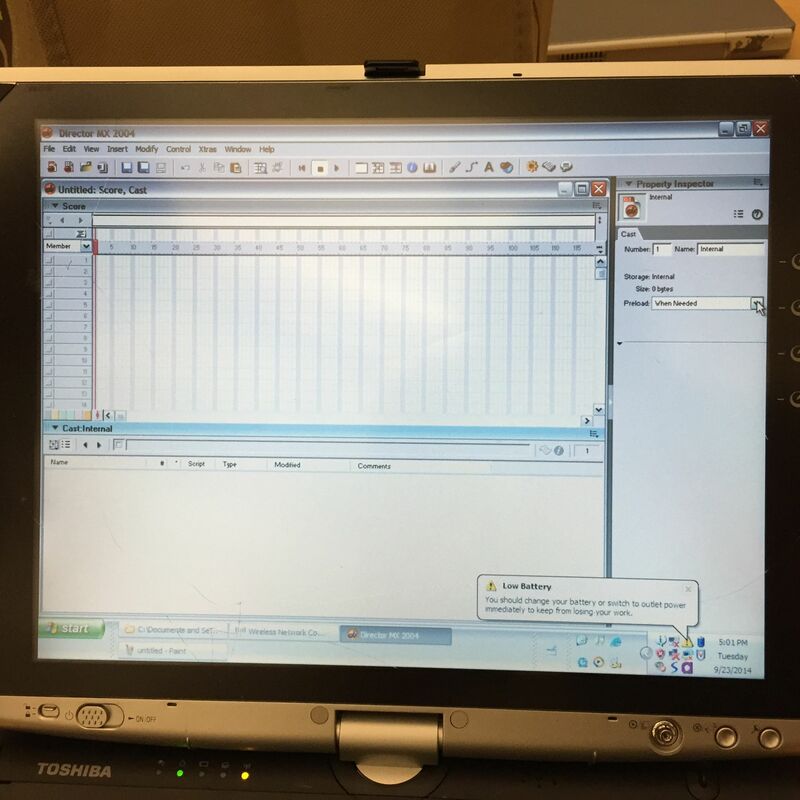 Our old laptop, freshly awoken from 2007. 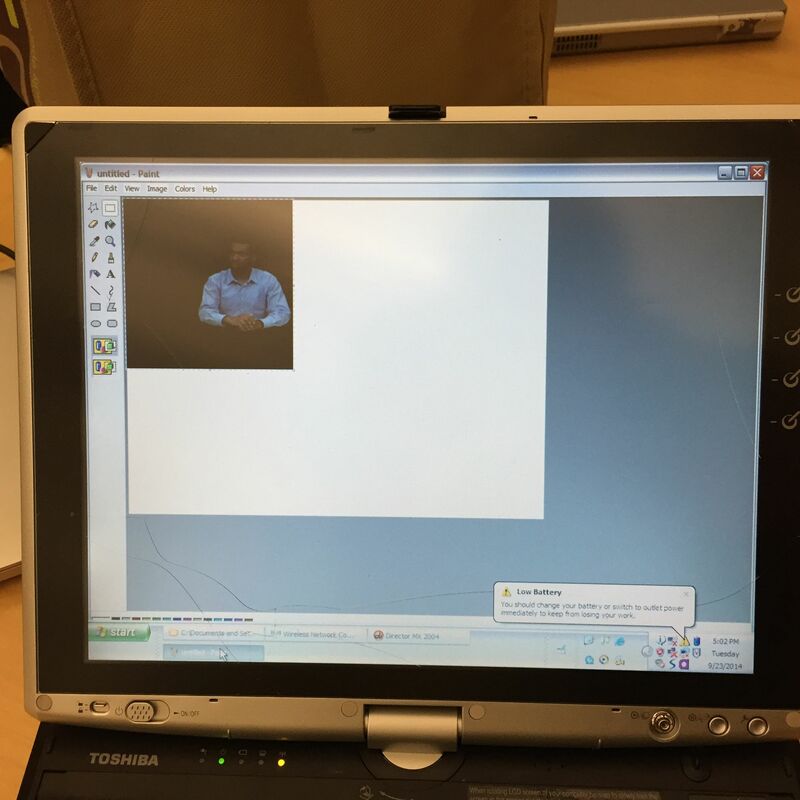 If you look closely, you can see the cracks on the display (from us holding it up as a tablet; this is one of those original convertible tablets from the early 2000's, complete with Wacom Pen). We're very afraid to connect this to the internet; it's such an old unpatched version of Windows XP, god knows what will happen. 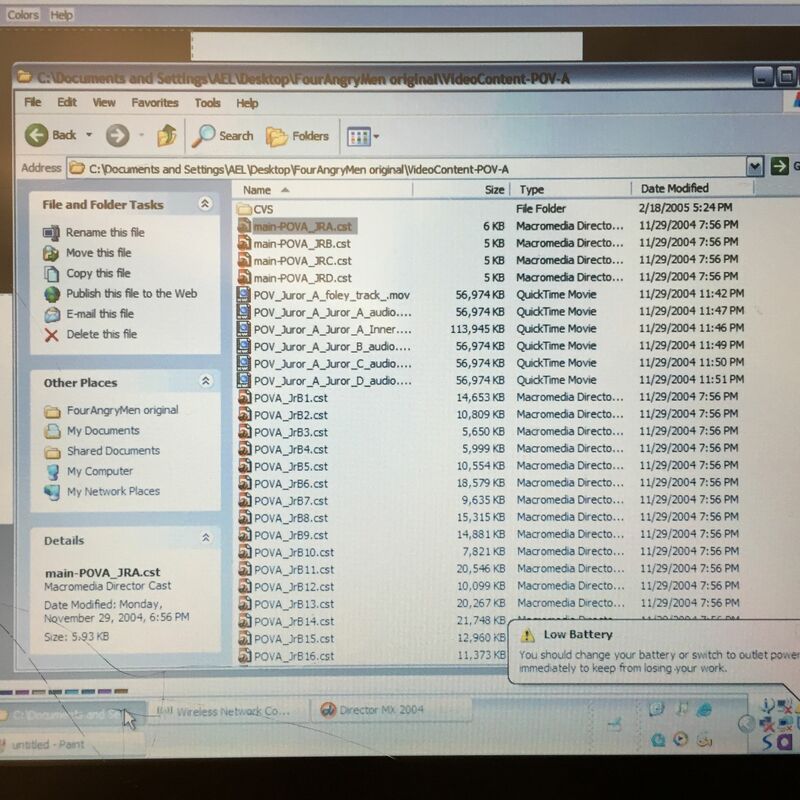 A few other windows were open, too: a file browser, where the newest date was the CVS directory (CVS, so old-school! ), 2-18-2005, 5:24pm. And, a Microsoft Paint window, with a video frame from Four Angry Men open. Good times! Some old files from 2005. We've got a lot of work to do resurrecting this stuff, but it's going to be a ton of fun, and I'm really looking forward to bringing it all to UIST! 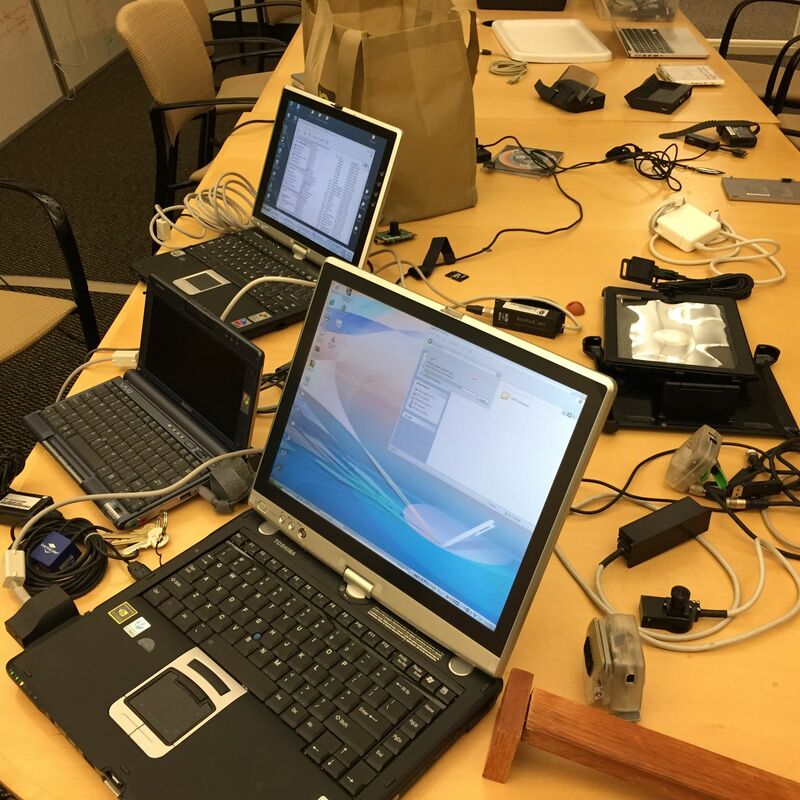 Here's the lab table as I left it today, covered with a pile of tech more than a decade old. See if you can find the tiny Intersense trackers that cost us ~$10,000 each back then! Like Frankenstien's lab, where we are trying to review a demo from the dead. Just for old times sake, here's a few videos related to DART. The video from our UIST 2004 paper. The video for Four Angry Men, probably the most elaborate AR experience we created back then.